Mom's Gone Bronson! 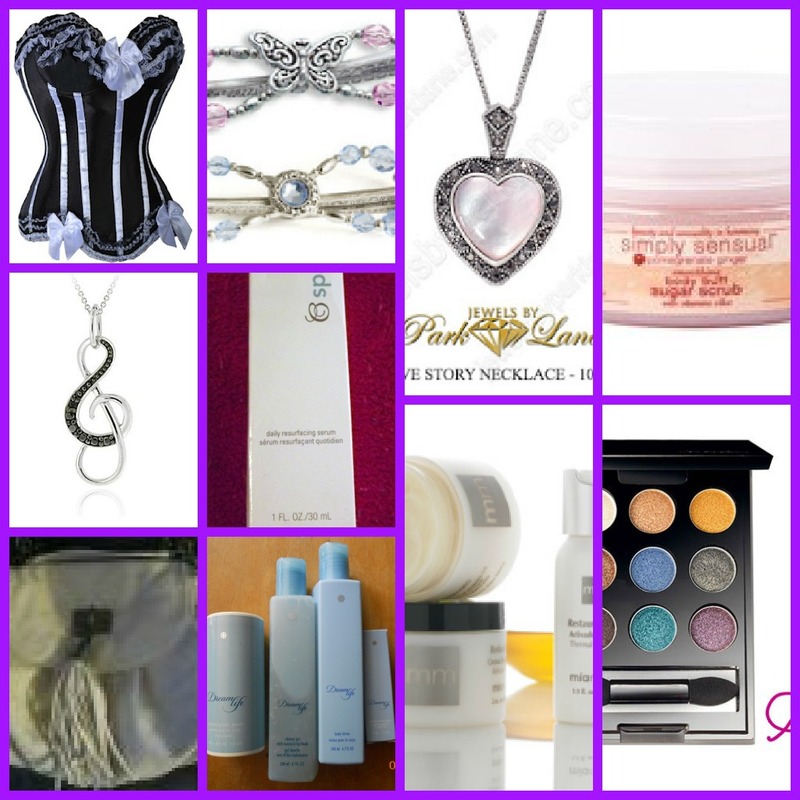 : It's A Date - Giveaway Event!! (Worth over $300!!) - Ends 8/23! It's A Date - Giveaway Event!! (Worth over $300!!) - Ends 8/23! On August 23rd Gluten Free for Jen is celebrating her 9 year wedding anniversary! In honor of this wonderful moment, she has this wonderful gift package worth over $300! One lucky winner will receive everything you see below! 1. Corset Chick- has your full line of corsets available no matter what your size is! They will be allowing the winner to select a corset up to $30 in value! 4. The beautiful Music necklace is being donated by fellow blogger SuperMomSurveys. This necklace is valued at $54. 5. A Daily Resurfacing Serum from another wonderful blogger over at Semmes Savers. 6. Cloud 9 Rep Emilee is kicking off her business by offering up a wondering Sensational Sugar Scrub. This has a wonderful Pomegranite scent and is valued at $24. 7. Fellow blogger Jessica is a Mark Rep who sales make up and purses and more. Winner will receive a eye shadow set valued at $16. 8.Mia Mariu has a line of make up, facial items and more. Gluten Free for Jen will have a review coming up for her as well but for now, one winner will receive their RestauraCel-C Thermal Microdermabrasion Set valued at $55! 10. Last but not least, Erin over at For Him and My Family is going to send the lucky winner a gorgeous purse from her Mark business! This purse is valued at $25! A huge thank you to Isabella over at Just Another Static Heart as well. She created the beautiful event button above! She is your go to person for web design and other blog odds and ends so please be sure to check out her page as well! So there you have it! A bunch of items to help you get ready for that perfect night out! This giveaway will run from 8/10 until 11:59 pm EST 8/23! This is open for US residents only. Winners must be 18 or older to win. Enter by using the rafflecopter form below! *Disclaimer - You must be 18 years or older, and a resident of the United States, in order to enter this giveaway and win this prize. Mom's Gone Bronson is not responsible for choosing the winner - nor are they responsibly for mailing the prize! Mom's Gone Bronson was in no way compensated or paid to promote this giveaway or to participate in this event. Thank you! It would be really nice to just go out somewhere nice, not to loud and have a dinner while chatting with hubby. Nothing special, just time alone! This sounds like a fabulous giveaway! A lot of great prizes! My perfect date would be a night out to eat with just the husband of course, followed by a movie or play. Even better would be if we didn't have to rush home because the in-laws or friends were watching the kids overnight.